How Long Will Chaos Reign In This Game Of Tag? In Raye’s family, there have been some funny coincidences. Many of you are likely familiar with the “birthday problem” — it says that even among a pretty small group, the odds that two people share a birthday are surprisingly high. Specifically, in a group of 23, the odds are 50-50. But in Raye’s case, among an extended family of 23 people, three pairs of people share birthdays. What are the odds of that? Moreover, all these pairs are on one side of the family, a group of only 14 people. What are the odds of that? Any group of two or more people can play. All players are active at the start of the game. Active players can run around and tag other active players. A player who is tagged becomes inactive and must sit on the spot where they were tagged. An inactive player becomes active again when the player who tagged them is tagged. Victory is achieved by being the only remaining active player. Extra credit: It’s been a while, so let’s offer up a 🏆 Coolest Riddler Extension Award 🏆. Tweak the rules, introduce some park geometry, make some players faster, or suggest your even more creative twist on this puzzle. The winner gets a shiny emoji trophy next week. Congratulations to 👏 Laura Niss 👏 of Boulder, Colorado, winner of the previous Express puzzle! There is an underlying logic to the numbers in the square below. You were asked to crack its code and solve for X.
X is 8. The underlying logic is multiplication. The outer two digits in each row and each column multiply with each other to give the two-digit number in the middle. For example, on the top row, six times seven is 42. In the left column, six times eight is 48. So to find X, we note that two times four is 0X, and that eight times six is 4X — so X must be eight. Congratulations to 👏 John Chapman 👏 of Toronto, winner of the previous Classic puzzle! You’re on a game show, and you’re asked to sit down at a table covered with sealed envelopes. You are told that each envelope contains a check. Each check is for a different amount, but you are given no other information about the distribution of dollar amounts. You may pick an envelope, open it and read the amount on the check. You can then either keep that check, ending the game, or toss it away permanently and open another envelope. You can then keep that second check or toss it away and open a third envelope. And then you can keep the third check or throw it away and pick a fourth envelope. If you open a fourth envelope, you have to keep that check, no matter how paltry it is. What strategy should you follow to maximize your chances of getting a nice payday? No matter what, you should open a second envelope. If that check is bigger than the first one, you should stop there. If it’s smaller, you should open a third envelope. If the third check is bigger than the second, you should stop there. If the third check is smaller than the second check, then you should open a fourth envelope. Why? First, the picking of the envelopes off of the table one-by-one is a red herring. All that matters is that you will open up to four envelopes, so those four envelopes could be picked out in advance and the rest discarded. Those four envelopes will contain four different checks — call them A, B, C and D, where A is the smallest check and D is the biggest. The most basic strategy would be to just keep the first check no matter what. That gives you a 1/4 chance of getting D, C, B or A — in other words, only a 25 percent shot at the biggest check. But we can do a lot better than that! 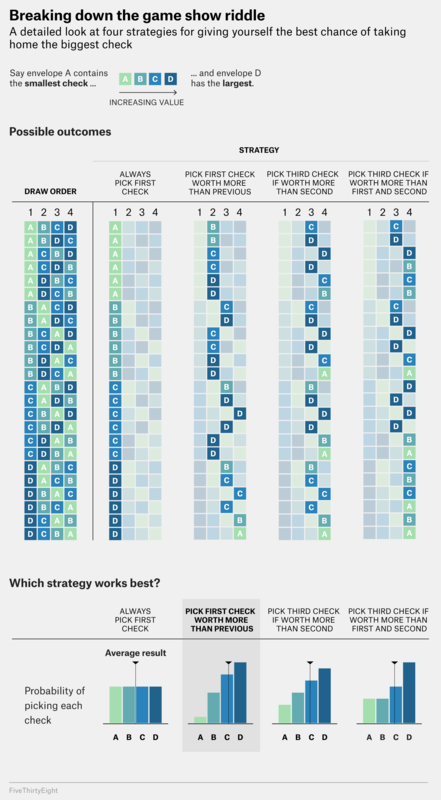 The strategy described above gives you a 5/12 chance of getting the biggest check, a 1/3 chance of getting the second-biggest check, a 5/24 chance of getting the third-biggest check and only a 1/24 chance of getting the smallest check. You can calculate these probabilities using the table below, which shows all 24 hypothetical orders in which the unseen checks might be arranged before you begin the game. Under the strategy above, in only one case — the arrangement DCBA — will you wind up with the smallest check. Yet in 10 of those 24 scenarios (5/12) you end up with the biggest check! In eight arrangements (1/3) you wind up with the second-biggest check, and so on. Here are two other plausible strategies you may have considered: One, open the third envelope no matter what and then stop if the third check is bigger than the second check; otherwise open the fourth envelope. Two, open the third envelope no matter what and then stop if the third check is bigger than both the first and second check; otherwise open the fourth envelope. Both of these strategies do a lot better than just keeping the first check but not as well as the “stop as soon as you get an increase” strategy. The outcomes of these two plausible strategies are also described in the table below. They both result in the player getting a check that is, on average, worth much more than they’d get using the keep-the-first-check strategy, but not worth quite as much as they’d get using Dave’s solution.